Check out our upcoming events below - all are welcome. A free 2 day conference at the Royal Welsh Agricultural Showground from Friday 4th - Saturday 5th October 2019. 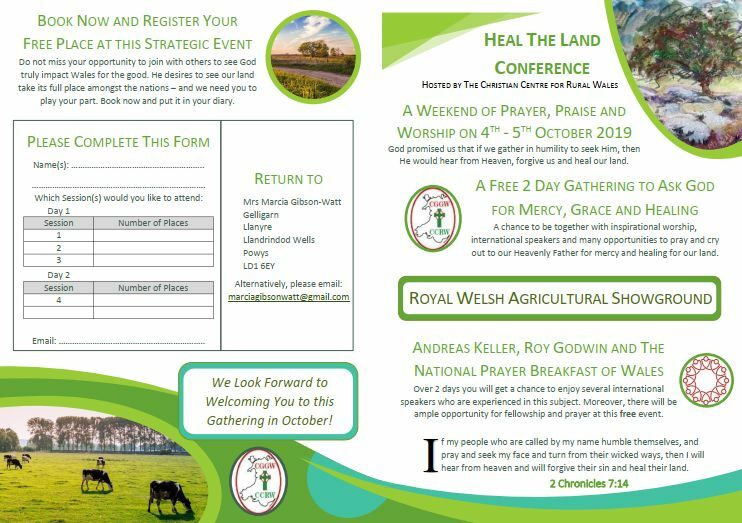 Join international speaker Andreas Keller and Wales' own Roy Godwin from Ffald y Brenin as they lead us in teaching, worship and prayer for God to bring Healing to our Land. The National Prayer Breakfast of Wales will be commencing the event with a Breakfast Brunch to include prayer and reflection at 10am on the Friday. For full details please click the image above or click here. Edrychwch ar ein digwyddiadau sydd i ddod isod - croeso cynnes i bawb. Fersiwn Gymraeg dod yn fuan.